CRASH COURSE is a complete revision guide designed specifically to save you time by providing everything you could be asked in the exam in one place. Each book in the series has been specially written by either senior medical students or junior doctors – carefully supervised by faculty advisors – to ensure that it exactly matches your needs by having been prepared by someone who has just been in the exam situation. 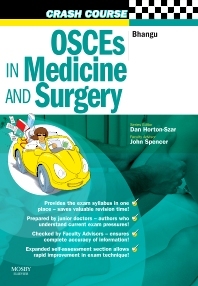 New to the series, this book is a guide to the modern OSCE and covers the core part of the OSCE assessments from the first year of medical school through to ‘finals’. Designed as a ‘dip-in’ guide to help you perfect your skills, Crash Course OSCEs in Medicine and Surgery contains over 50 'stations' grouped by body system. Each section covers history and examination and explores special requirements relating to that body system, including data interpretation and practical skills such as preparing discharge summaries. Take the stress out of study with CRASH COURSE – the easier way to achieve exam success!